The Ground Awards Dinner is an annual dinner held in close coordination with the Deputy Commandant for Plans, Policies and Operations. The focus is on the Ground Combat Element of the Marine Air Ground Task Force and on providing professional recognition to the top performing leaders in the ground combat community from the preceding year. This is MCA&F’s most well attended professional event and invariably approaches almost 600 attendees including a very high proportion of the Corps’ most senior leadership. 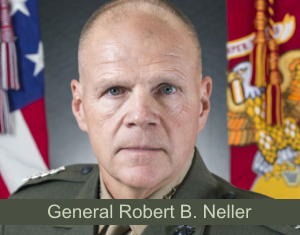 General Robert B. Neller, Commandant of the United States Marine Corps. Active duty service members can attend for free, but still must register to attend by calling 703 640 0174 or emailing Sarah Cohen. USAA; General Dynamics; Raytheon; Harris; BAE Systems; Lockheed Martin; Perspecta; FLIR; Booz Allen Hamilton; Anglicotech; Nammo; Oshkosh; Rheinmetall; Rolls-Royce; SAIC; Boeing; Ernst & Young; MSC; Northrop Grumman; Alexandria Insights; Amazon Web Services; Battelle; CUBIC; GID Solutions; Guidehouse; Innovative Reasoning; KPMG; ManTech; MetroStar Systems; Textron; United Global Group; AAR Corporation; AM General; Leonardo DRS; Elbit Systems; ECS; LMI; Sikorsky; Kalmon & Co.; RSTARS Impact Fund; General Dynamics Land Systems; Conflict Kinetics; Trijicon; Pratt & Whitney; Deloitte; SKB; Nevada Automotive Test Center; and TWORX.